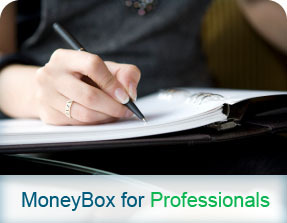 MoneyBox - Financial Management Software for Home, Professionals and Small Business. Manage your money, control payments, project cash flow, administer budgets, and handle currencies all in one simple user interface. Password protection you can trust. Click here to find out more. How much does MoneyBox cost? 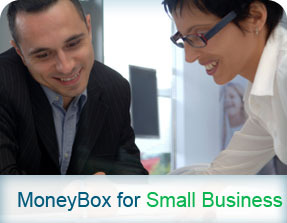 MoneyBox costs €30 and is a leased software product. The normal lease is for one year's use. During the lease period you will receive full product support. Absolutely. The data you accumulate in your usage of MoneyBox and WebSafe is stored in your own storage. MoneyBox data can be encrypted if you choose that option. WebSafe data is always encrypted. If you share any of this data with us so that we can provide technical support, we store this data for a maximum of two years as a last resort backup for you in the event of catastrophic data loss on your own system. This data is held in encrypted storage and will be deleted immediately if you request it. Under no circumstances is this data shared with any third party for any purpose. We also hold the contact data you give us when you purchase a PIN for our products. This data is held in encrypted storage and is not shared with any third party for any purpose. Can I convert data from my existing accounting software into Moneybox? Yes you can. It's easy to migrate data into your MoneyBox software. In fact, for software such as Quicken® it can be done automatically. I live outside of the UK, can I still download MoneyBox? Yes, Money box is a global accounting product, with over 100,000 users in 50 different countries.